These were the middle range of the series of valve preamps that Glen Croft made in the eighties and early nineties, and which ranged from the basic Micro at around £200 to the Mega Micro with its separate box power supply at £1500 or so. I owned a Super Micro Mk. 2, which for some inexplicable reason a burglar made off with (along with my CD player, tape deck and Arcam DAC), the Super Micro Mk.3 which replaced it, and a Super Micro A IV PP. All of these featured fully valve-regulated power supplies and Glen's trademark dual volume controls, which are a great idea in principle, but a pain to use. The Micro series has in recent years been replaced by the Vitale, Epoch and Absolut, with their looks much improved over the almost industrial black boxes of the last series. I guess the Super Micro A now corresponds to the Epoch Elite. I resisted the temptation to mess around with these preamps - the basic designs are excellent value for money, and I couldn't think of any way to improve the Super Micro A short of considerably enlarging the power supply a la Mega Micro. Croft's amps at shows tend to have huge external power supplies (I remember one phono stage in particular that had a power supply with twice as many valves in as the signal circuit did). The Super Micro had pretty much the same signal circuit as the plain Micro, albeit with upgraded components, particularly in the phono circuit. The circuit is fairly simple and traditional, with an ECC83 per channel for the RIAA stage and half an ECC82 per channel for the cathode follower output stage. What raised it above the basic Micro was the regulated power supply consisting of an ECL85 and a voltage regulator tube. The main difference between Mk. 2 and Mk. 3 seemed to be the provision of a negative HT voltage for the cathode of the output valve. This was my very first valve amplifier, and with a Quad 306 (and later with Croft's own Series 5) made very dynamic and enjoyable music. It had a particularly good phono stage, which went well with the Roksan and Milltek cartridges I used with it. This, at about twice the price of the Super Micro, marked the next step up the upgrade ladder. Glen Croft has the reputation of putting into his amps whatever he happens to have in his parts bin if he thinks it will sound good in a particular circuit. As a result serial numbers and model appellations lose much of the significance that they have in other manufacturers' ranges. The Super Micro A Mk.IV, for example, for some reason was released simultaneously in two very distinct flavours. The "PP" had each of the valves doubled up in a shunt-regulated push-pull (SRPP) arrangement, while the "Octal base" used a simpler circuit, but with the ECC83s of the Super Micro replaced by 6SN7 and 6SN7 octal-base valves. I heard both versions in KJ West One and preferred the PP, which sounded very neutral and transparent, and certainly cleanly outclassed the plain Super Micro. The phono circuit in the Super Micros is actually quite unusual. The first stage provides raw voltage amplification. The RIAA equalisation is achieved around the second stage as shunt feedback, the odd thing being that the feedback impedance goes to infinity at DC, instead of some constant, which is usual for this kind of configuration. This, I presume, works in practice because of the limited open-loop gain of the second stage. The disadvantage is that the low-frequency pole of the RIAA response may change as the valve ages. As confirmation that Glenn's products were in a constant state of flux, here is the circuit of Super Micro A S/N 566 posted by its owner, which differs subtly from my own,which was S/N 533. 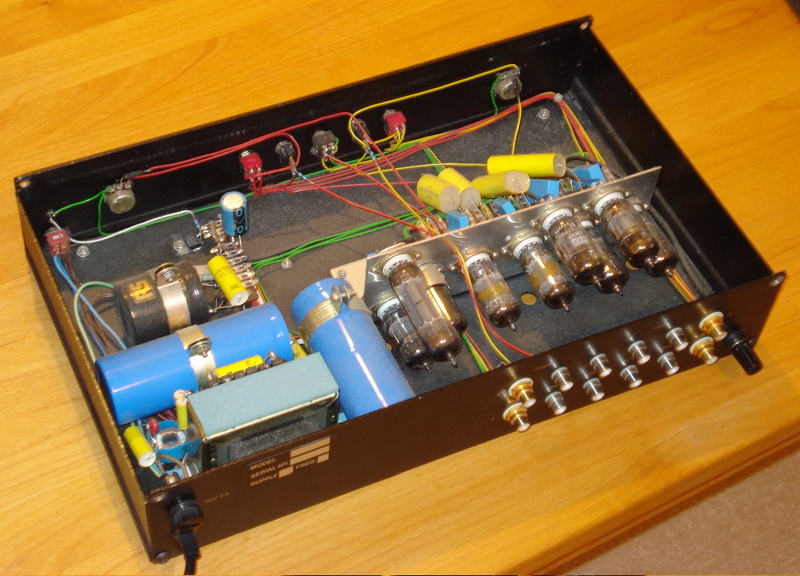 I eventually replaced the SMA with a DIY passive preamp and a discrete transistor phono stage from John Linsley Hood. The passive was definitely slightly more transparent than the line stages of the Croft, although the valve phono stage was still very satisfying to use, if not quite as quiet as the JLH. I never found out how to use the SMA's phono stage with the 10K passive, as even this loading on the record output significantly reduced the bass response. I kept the Super Micro packed away for several years, but I had fun comparing it with my DIY solid-state preamp and with my new Realtime Preamplifier (the RTP3 won, by the way). In the end, though, I decided that with its low phono gain it was unlikely to take its place in my system in the long term, so I sold it to a grateful ex-SMA owner who had had his stolen. A discussion of Croft and Audio Research preamps by an enthusiast. The home page of Croft Acoustics. Martin Colloms's Hi-Fi News review of the original Micro premplifier. 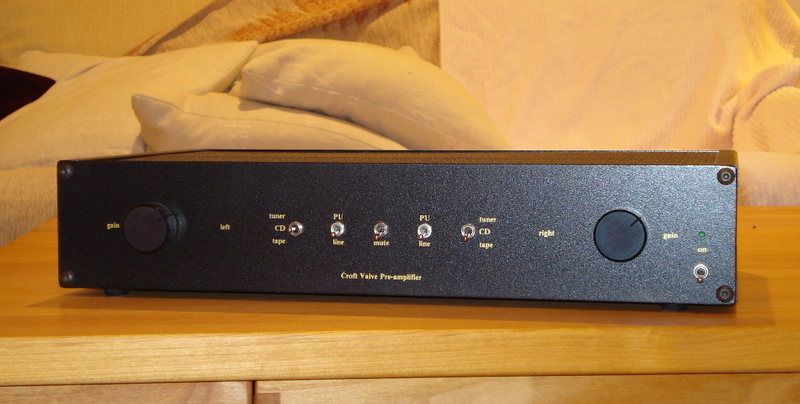 Ken Kessler's review of the Super Micro and Series 5 amplifier.